For the past two years, I have been working remotely on web development and architecture with an american client, Kenzan Media. As you might have gathered from past blog posts and tweets, I have put aside the visually creative side of my abilities, and concentrated on the more technical ones. I know this contradicts what I once said, but only a fool does not change his mind. Being part of a big team, working on technical things, and in a ticket-based environment, allowed me attack new technologies–such as and Angular, Bower, and ES6, amongst others–one bite at a time, and enjoy it a bit more than in the ever crunch-mode-driven environments of ad agencies and startups. Working remotely allowed me to also rethink how to invest my time in my work, but it especially freed me from needing to be in a certain location to work. I chose to travel and work at the same time, and this is what I’d like to share with you in this post. Many countries around the world offer work/holiday visas. In short, those visas allow you to stay on a certain territory longer than the usual 90 days that a tourist visa permits. Lots of Europeans take advantage of these visas to come to North America to either study or try and live the “American dream”. Canadians and Americans don’t seem to take advantage as much of these visas. Is it because we are content where we are? Or is it because Europe is quite expensive and that we are crushed by our student loans and other debts? Whatever the reason, it was the last call for me if I wanted to benefit from one of those visas, as they usually related to the age of the applicant. Also, I have had an odd experience living in the Netherlands because I did not speak the local language. As French is my native language, I obtained a visa for France. And so my trip began: I lived in Paris, Barcelona, and Toulouse. In my hometown, Montréal, I have an office at home from which I work. However, while I was traveling, I thought it would be smarter for me to rent a desk in a coworking space. These spaces usually allow you to meet other people, discover some new ways to work, and let’s face it, have a social life. I could have very well worked from my own apartment, wherever it was, but what would be the point in traveling then? In Paris, I worked at Le 39 in the 2e arrondissement, right next to Porte Saint-Denis. This space was my first contact with coworking spaces. Many startups and some freelancers work there, mostly around the theme of tech startups. The DotConferences organizers also worked in that space, which was my contact point to discover and attend DotJS. When winter hit Paris, I wanted to go south. Being from Canada, I already knew cold and snowy winters. Having lived in Amsterdam for a while, I also already knew rainy winters. Since I needed somewhere sunny, I settled for Barcelona (out of France, I know). The city charmed me when I quickly visited her some years ago, so I chose to go back. Over there I rented a desk at MOB (Makers of Barcelona), a coworking space more aimed at makers and their culture. Whereas Le 39 was mostly a shared office, MOB was building a community and a social life. Their organizers make sure people know each other and the café at the entrance is the perfect spot to get to meet other Mobbers, as they call their tenants. That was perfect for me, as I didn’t know anyone in Barcelona. When March arrived, I moved back to France, this time in Toulouse. There also, there are plenty coworking spaces from which to choose from. I ended up going at La Cantine, which actually felt like the middle between Le 39 and MOB: the space is more startup-oriented, however they do have a sense of community, since the space is a hub for conferences and presentation à la TED. There is currently in France somewhat of a tech rush, a passion for technology and tech startups. The French word for this would be effervescence, which could literally translate to fizziness. I know it makes no sense as a literal translation, I just think it’s funny. 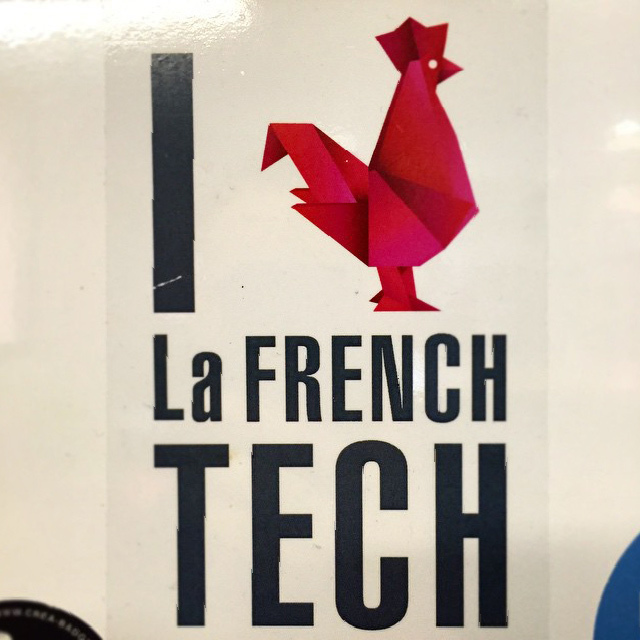 They have named that movement La French Tech. Appropriately, the rooster has been chosen to represent the movement. The Gallic rooster is an unofficial national symbol of France. It makes sense. In case you did not know, the French have a passion for everything American and written in English, as if it gave things a cooler vibe. As such, the French Tech branding is oftentimes in English. And they created the sticker shown above. During my months in Europe, I tried as much as I could to attend events and visit contemporary arts galleries. I discovered Le Prix Cube just south of Paris, stumbled upon the magnificent LLUM BCN light festival in Barcelona, attended Resonate again this year, amongst other things. With my clients in North America–some in EST and others in MST–I was between 6 and 8 hours ahead. That freed me to train in the morning and have long lunches, but this also meant it was harder to coordinate and have an evening social life. After a while, trying to do and see as much as I could while working much was tiring. Moving every second or third month, always living in luggage, not really have a home, and not really being able to relax took its toll. I chose to move back to Montréal to be able to work at a more reasonable pace. Don’t get me wrong, I am not complaining. I am very lucky, I enjoyed a lifestyle many would envy. However, for your own sanity, it’s important to live according to your own rules and beliefs, and not let the others–some of whom may even live by proxy through you–dictate your path. That being said, this is a quick overview of my experience. I was able to meet with old friends and make new ones, know myself and my craft a bit better, as well as enjoy discovering quite a few cities. I highly encourage anyone who has the opportunity and the energy to try this lifestyle for a while. Ever since I left Amsterdam a few years ago, I had been trying to find a way to go abroad again. Looking too far ahead might not necessarily be the best way to go about things, since you may end up missing out on things that are just around you, while you keep your eye on your faraway long term plans. As such, I have decided for now to settle down in my hometown. I will travel again for some time, but if I keep a stable pied à terre, a stable home to which I can come back, traveling will probably not be as exhausting. I have already plans to visit San Francisco and attend AngularU during the last week of June. Let me know if you also intend to be present, or simply if you want to meet up while I’m in Fresco. During my trips, I obviously met with other travellers, and also with tons of people that were great about sharing their knowledge and their experiences. I’ll list some things that may be of interest to those who wish to try to travel and work remotely. If you know of more resources, of want to share your experience of either living abroad, or working remotely, don’t hesitate to comment! Bureaux à partager: A site that allows you to search for coworking and meeting spaces in France. bureau-paris.fr: Another site that allows you to search for coworking and meeting spaces, more specifically in Paris. Le 39: This is where I worked while in Paris. Good people, passionate devs and startups. Numa: A startup accelerator and coworking spaces organization. They had a café not too far from le 39 in the 2e arrondissement. Anticafé: French people usually frown upon you if you go to a café with your laptop, it’s a social no-no. At the Anticafé, the concept is the reverse: you don’t go there only for a coffee, you go for the space and you pay for the duration of your stay. MOB (Makers of Barcelona): The maker space from where I worked while in Barcelona. Awesome peeps and a good ambiance. I would have stayed longer. Betahaus: Another coworking space in Barcelona. I haven’t been. Barcelona Coworking Spaces, by Dan Blystone: The article that allowed me to discover MOB. La Cantine: The coworking space from where I worked while I was living in Toulouse. They are also quite active with presentations, conferences, and meet-ups. Étincelle Coworking: Another coworking space in Toulouse with whom I was in contact prior to renting my space with La Cantine. Berlin’s 10 Best Coworking Spaces, by Linsey Fryatt: When I visited a good friend of mine in Berlin, he mentioned he also was working in a coworking space. I forgot which, but I stumbled onto this article trying to find the space’s name. I thought I’d share it with you. Applying for the Spanish non-lucrative residence visa, by Mark Hendrickson: Mark was one of the guys that also rented a desk from MOB. This is an article he wrote about moving to Spain. Digital Nomad Conference: A conference about working remotely. Digital Nomad Jobs: A job board for those who wish to go abroad. Nomad List: A calculator of sorts that allows you to figure out where you’d like to go to work remotely.